There are 5 stations in this Short Vowel packet. 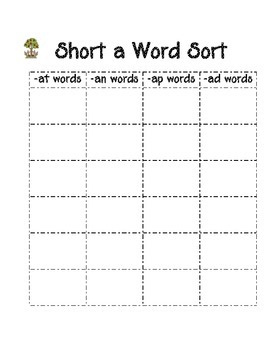 Students can work on sorting short a words into 4 piles (at, ap, an, & ad words). They will then record the words onto the correct column on the recording sheet. They will repeat the process with short e words, short i words and short o words & short u words. 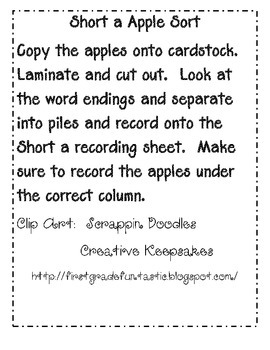 These can be set up as a whole class activity. 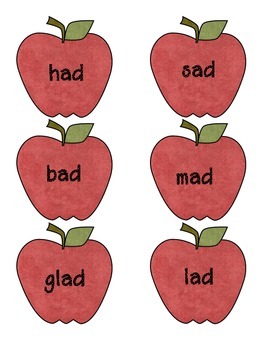 Each day you cover a new short vowel, you can talk about the word families on the apples and separate them as a class. You can also use these as stations, with 5 different stations to go to. Each short vowel station has a recording sheet to go with it.